The kind of wall paint you need depends a bit on your wall surface, and your wishes for looks and eko-friendliness. Further down, you'll find a range of options. On the average walls (drywall, with or withour wallpaper), latex paints are mostly applied. But there's no latex in latex paints - the binder is vinyl, PVA or acrylic resin. Cheaper latexes (with vinyl or PVA) resemble plaster or gypsum - they're chalky and they're not always scrub- or waterfast. The better latexes (with 100% acrylic resin) are much more resilient to cleaning. They can be matte, semigloss or shiny if you want to, and they can be ordered in any shade (check here for choosing paint colors). If you need to do a primer first (when you paint over a very different color, consider using a colored primer - it saves you a paintlayer. 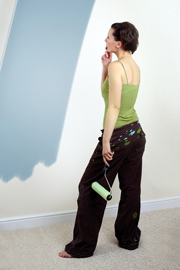 When you paint walls you use a lot of paint, so you might consider using low-voc or organic paint. Acrylics are better than the oldfashioned oil-based paints, but still they keep emitting gases after they've dried. Milk paint, or waterbased alkyd paints can be a good alternative. Some eco-paints can be color-matched, others come in a set of natural shades. Apart from a little extra cost, there are only advantages to having a colored primer. It saves you an extra paint layer: that's time AND money. You can order them here at ThePaintStore.com. An eco-friendly alternative for jobs like this: Dura-soy: a low-voc and water-born paint that does hide on one layer. It can be color-matched as well. 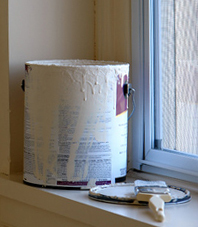 For choosing paint colors, use big sample strips, or house paint software. What's your wall made of? Each wall surface needs its own kind of suitable paint. On new drywall, first do a drywall primer, or apply a soy-alkyd paint. 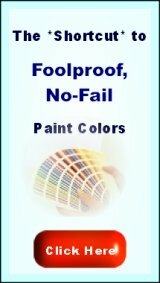 On latex paint, paint latex or acrylic latex. If you wall is painted with a strong semigloss or glossy paint, it might have been painted with oil based paint. Apply a primer or shellac sealer first - eventually use a color-matched primer. You can paint over wallpaper with latex or acrylic latex, but the structure will remain. Which can be a good thing - it depends on your interior design. 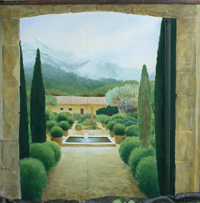 Click here for more on painting over oil based paint, and here for choosing paint colors. How strong should your wall paint be? If you'll paint the kitchen, it's a good thing to be able to wash the walls. 100% acyrlic latex is good for that, soy-alkyd is even better. For the bathroom walls, it's better to take matte paint, which has a better breathing capacity than glossy paint. But the tile needs the strongest glossy paint. If you want the paint to be extra strong, you can give it an extra polyurethane laquer or sealer. Cheaper latexes are less strong than the 100% acrylic ones, and less hiding. But 100% acrylic latex paint is almost as strong as oldfashioned woodwork paint. Before choosing paint colors, first decide on other major elements of your interior design: furniture, flooring, rugs and curtains. Make your colors into a color scheme. You can base it your furniture, or a picture, artwork or rug. Walls are big visual amounts, so the effect of a color change will be big. 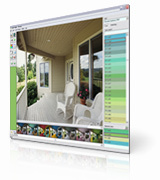 For visualizing that, you can use house paint software. 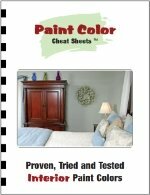 Click here for a review on the "Paint Color Cheat Sheets", a valuable tool for choosing interior paint colors. What room will you paint? Click here for some room painting ideas. Further in this website, you'll find lots of tips on choosing colors for different rooms and room functions. Structure has the big advantage of hiding smaller dents and wall damages. If it fits in your interior design, structure can be a very quick way of making your walls look like new again. 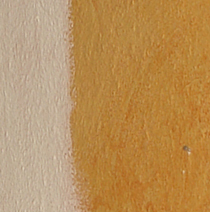 Regular latex can be turned into a structure paint, by adding a texture additive. Latex or acrylic wall paint? The difference between latex and acrylic paint is gradual. Both paints are synthetic - there's no latex in latex paint. The term "latex" indicates a softer paint, with PVA or vinyl binder. Acrylic latex is a lot stronger, more glossy and waterfast. It's almost or just as strong as old-fashioned woodwork paint or acrylic exterior paint. PVA or vinyl paints are softer, more absorbing, and less waterfast. The paint quality also reflects in the price - acrylic latex is more expensive than PVA or vinyl. If a paint is called 100% acrylic latex, it's a good strong paint and also suitable for woodwork. 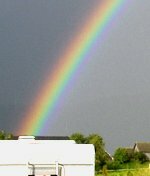 Check here for Dura-soy one - a waterbased alkyd paint. It's an eggsheen-gloss, creates a strong film, is sustainable and very low on VOC, and can be matched in any color. Check here for more on milk paint or egg-tempera.